White_10_x_10_Square_Envelopes is rated 5.0 out of 5 by 1. Rated 5 out of 5 by Dottieb from Great purchase! We purchase these 10x10 white envelopes for mailing our annual reports and they are a perfect fit and the price is right. You'll have the perfect 10 once you get a hand on these White 10 x 10 Square Envelopes. The perfect white shade and the perfect square will make even the toughest of judges raise their '10' sign up! White Square 10 x 10 Envelopes are perfect for sending out oversized invitations, greeting cards, photographs, flyers, and more. With the classic white, you'll be able to match any color that you put inside. Go with a black invite for a classy look, or a baby pink card for a sweet look, even a vibrant birthday blessing with red. These big white envelopes can seriously do it all! 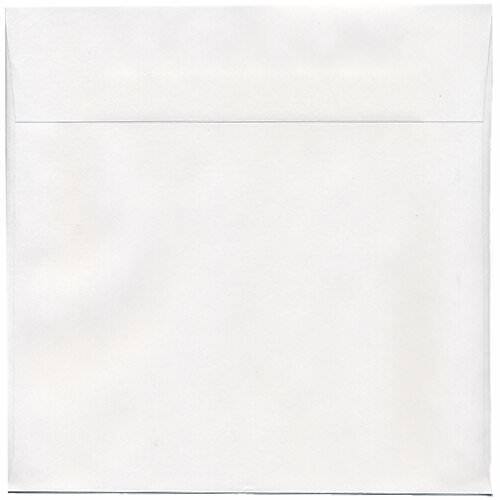 These white square envelopes measure in at an even 10 x 10 inches and feature a rectangular gummed flap closure, making your mail tight and secure inside. Available in White. Looking for another square? Check under 'Other JAM'n Products You Might Like' for a sneak peek at our wide range of square sizes! All in white!